1) Make a list of potential dinner guests. 2) Write down a hosting goal. 3) Focus on hospitality, not entertaining. 4) Keep the conversation focused on them. I’m sure you’ll agree with me that making friends as an adult is hard. You can’t just run up to someone at the grocery store, tell her that you love her hair and run off skipping together, holding hands, like you could as a kid. But what if I told you that by inviting someone over for dinner, you’re effectively doing the same thing? Inviting someone over is one of the best ways you can build friendships as an adult. You’re not just sitting back, waiting for friends to come to you. You’re being proactive. You’re taking charge. You’re saying, Come into my home, sit with my family, share a meal, and let’s get to know each other. 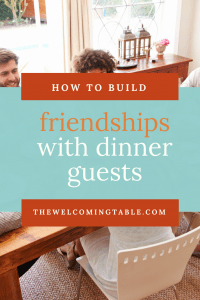 Today I’m going to share with you five intentional things you can do to use dinner invitations to build friendships. If you want to make new friends, it helps to do some intentional thinking about who you want to invite. Pull out a piece of paper and start brainstorming. Who have you been trying to get together with for a long time? Are there types of friends you’re looking to make (for example, someone you could start running with or an older couple who is a step ahead in their parenting journey)? Don’t rule anyone out — write down every name that comes to you. Then circle or star 4-5 people that you’re most eager to spend time with. Now that you have a list of people that you’d like to get to know better, you need to make a goal that helps you follow through. You can’t build friendships without prioritizing them, and research shows that just by writing a goal down, you are much more likely to achieve it than if you keep it in your head. Take that sheet of paper and write down a hosting goal that’s specific and realistic for you. 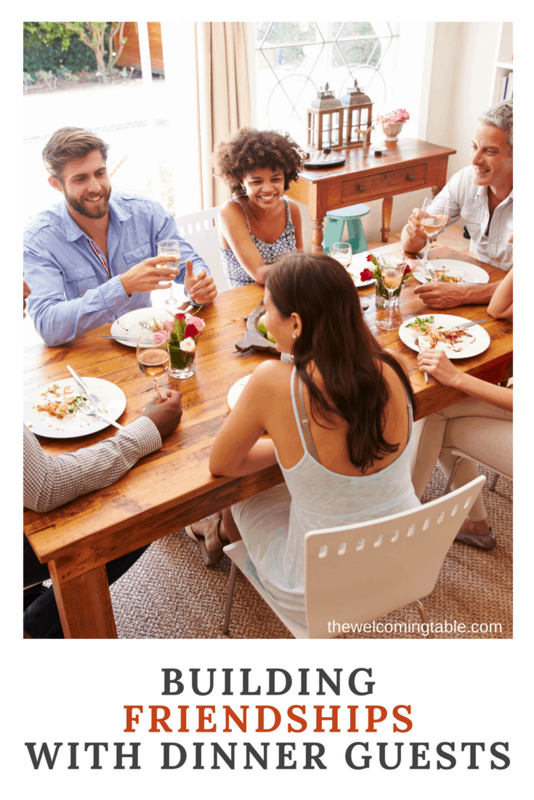 How often will you host meals in your home? Are there specific groups of people that you want to get to know (for example, your neighbors or families from your kids’ school)? Entertaining can be exhausting. If you feel pressure to create a put-together house, cook incredible gourmet food, and decorate with beautiful place settings and centerpieces, it’s no wonder you’re afraid to invite anyone over. Entertaining focuses on impressing your guests and putting up an appearance of perfection. Hospitality, on the other hand, just focuses on your guests. Hospitality is all about making your guests feel welcome and comfortable in your home. It’s caring more about getting to know them than what they think about your cooking or decorating style. Your meal is just the reason to get together, and your house is just the place to gather for that meal. Let go of the “entertaining” mindset that says there’s a right way to do everything and just focus on spending time with your guests instead. Did you know that you are more interesting to another person when you show interest in them? It’s true. People like talking about themselves, and when you steer the conversation towards them, it shows that you care about who they are. Be an active listener. Show them that you’re paying attention through good eye contact and interacting with what they’re saying. Put your phone and other distractions away. Make them feel like they’re the only people that matter in that moment (because they are!). Remember FORD: Family, Occupation, Recreation, and Dreams. These four topics are generally safe for conversation and give you information that you can expand upon over the evening. Make mental notes of what they say. It means the world to someone when you truly pay attention and remember details of a conversation later. You can use those details to ask more questions, too. Once the night is over, there are a few things you can do to continue building the friendship that you’ve begun. Check back in. If you see something that reminds you of a conversation you had, send them a link or a text letting them know it made you think of them. Or if you know about something that’s coming up in their lives, give them a call or ask them about how it went the next time you see them. Invite them again. An important part of friendship is how often you spend time together. Be willing to follow up soon with another invitation if you feel like you clicked with your guests. Sometimes people need that reassurance that you really do want to hang out again. And you don’t always have to wait for the other person to reciprocate. Making friends as an adult doesn’t have to be hard. It can be as easy inviting someone over for dinner. 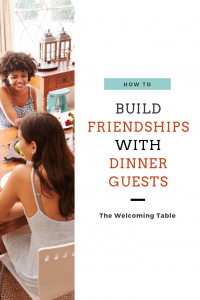 And to build friendships with your dinner guests, you have to be intentional about who you invite and how often you’ll host, focus on hospitality (not entertaining), keep the conversation focused on them, and follow up with them after your evening. When you invite someone over for dinner, you’re extending an invitation, not just to dinner, but to friendship. Which of these ideas will you put into practice? Share in the comments! As my 15th anniversary approached and I knew 2 other couples who had the same anniversary date and 15 yrs or more together, I planned an anniversary dinner for all of us at my house. This was the 1st time we all had had dinner together anywhere. I planned some little activities to kind of remind us all of the romance we once had when we first were married. That got a little awkward–not everyone has the same definition of romance! But overall it was really fun and I think the other couples thought it was special that we did this “same anniversary” thing together. I like the idea of having a goal (in this case, share with each other dating/married life memories) and the shared anniversary automatically gave us all something in common. I love this, Lauren! What a creative way to both celebrate your anniversary AND build friendships. Thanks so much for sharing. Sandi this is great! Thank you. I have been thinking about doing this w/ couples I want to get to know better. Shirle, you should!! You always make me people feel so welcome.